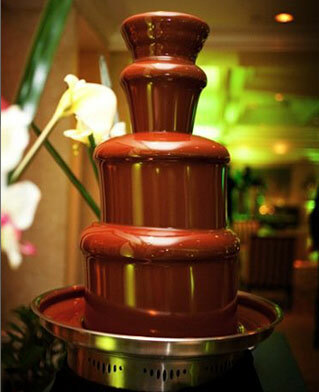 The chocolate fountain is a unique and elegant addition to any special occasion. 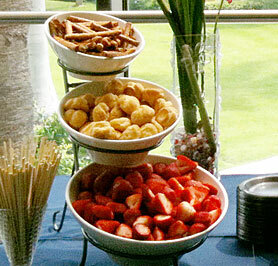 It enhances any buffet table, wedding reception or food service event, by offering a new dimension in chocolate fondue. We supply our fountains to hotels, catering companies, event planners, private parties and restaurants. 2. What kind of chocolate is used in the fountain? 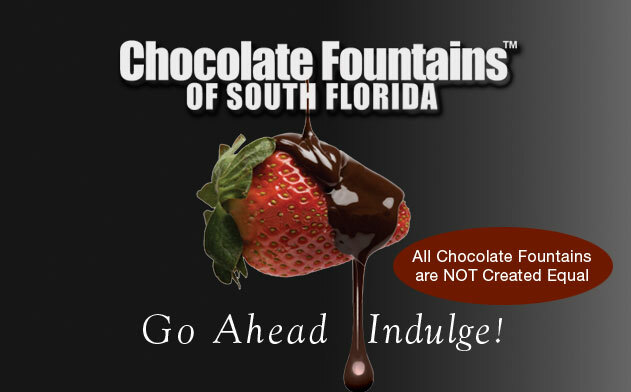 Chocolate Fountains of South Florida uses only the finest premium Belgian chocolate available. Our chocolate is specially formulated to provide flawless chocolate flow. Your guests will rave about the beauty, aroma and intense flavor. Simply… exquisite! 3. 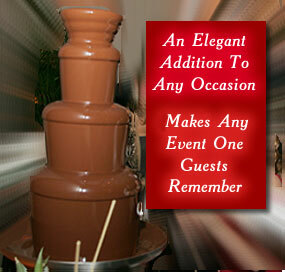 What is the maximum number of guests that the chocolate dipping fountain will serve? Our fountains are ideal for events of all sizes. No event is too big or too small. 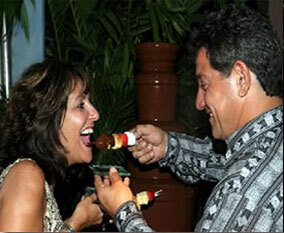 Chocolate Fountains of South Florida can accommodate groups of 20 to 5,000 people. We work with you to customize each event to your specific needs. 4. What are the table and electrical requirements? The chocolate dipping fountain requires a sturdy, level table for it to operate properly (must hold 100 lbs.) The table should be covered and skirted in table linen coordinating with your event. The fountain also requires a dedicated, 110 volt electrical outlet with 15 amps within 10 feet of where the fountain will be located. 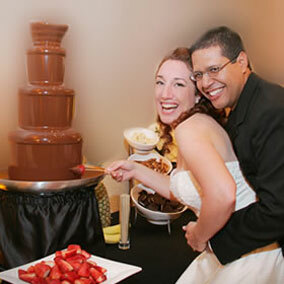 5. Who is responsible for set-up, maintenance, tear-down, and clean-up of the chocolate dipping fountain? We do all the work for you! We arrive with ample time to ensure that your chocolate fountain will be ready for your guests. A professional attendant will be on hand to show your guests how to enjoy the fountain as well as to keep the fountain pristine at all times. Once the event is over, we will dismantle and clean up and remove the fountain. 6. 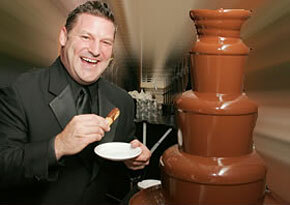 How long can I have the chocolate dipping fountain at my event? Our package includes up to two (2) hours of service, not including set-up and breakdown which are on our own time. There is extensive labor in melting the chocolate for your event, preparing the fountain, as well as cleaning the fountain and its parts after your event. Additional hours are available at a minimal charge. 7. What can be dipped in the chocolate dipping fountain? 8. Can the chocolate dipping fountain be used outdoors? It is highly recommended to use the chocolate fountain indoors. Outside weather conditions play an important factor on the flowing consistency of the chocolate. However, for an additional charge, we can provide an elegant windguard. Please inquire when booking your event. 9. Do you require reservations and deposits? Yes! A 50% retainer is required to guarantee your date. Reservations are on a first come first serve basis. 10. What areas do you service? Currently we are serving Dade, Broward and Palm Beach Counties. Outside of these areas can incur a traveling fee.